Erythrodermic psoriasis is a particularly inflammatory form of psoriasis that often affects most of the body surface. 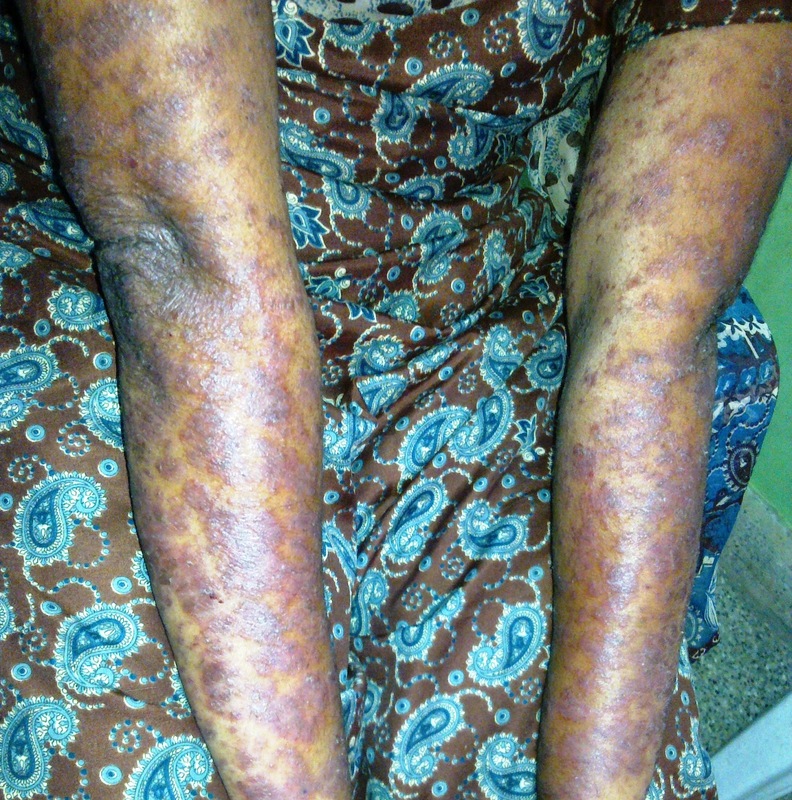 It may occur in association with von Zumbusch pustular psoriasis. It is a rare type of psoriasis, occurring once or more during the lifetime of 3 percent of people who have psoriasis. It generally appears on people who have unstable plaque psoriasis. This means the lesions are not clearly defined. Widespread, fiery redness and exfoliation of the skin characterize this form. Severe itching and pain often accompanies it. Erythrodermic psoriasis "throws off" the body's chemistry. This causes protein and fluid loss that can lead to severe illness. Edema (swelling from fluid retention), especially around the ankles, may develop, along with infection. The body may not be able to maintain its temperature. This can produce shivering episodes. Erythrodermic psoriasis also can bring on pneumonia and congestive heart failure. People with severe cases often require hospitalization. Erythrodermic psoriasis can occur abruptly at the first signs of psoriasis or it can come on gradually in people with plaque psoriasis. The reason erythrodermic psoriasis appears is not understood. However, there are some known triggers. ü Systemic medications are most effective and usually are required to bring severe cases under control. ü Combination treatments are frequently required, meaning using topical products and one or two systemic medications. ü Once the erythrodermic psoriasis flare passes, the psoriasis usually reverts to the way it looked before the flare. Some health care providers may prescribe pain medications, as this is an especially painful condition. Medication for itch, anxiety or sleep may also be prescribed if appropriate.